No left-winger, Wilson is a lifelong conservative who delivers his withering critique of Trump from the right. A leader of the Never Trump movement, he warns his own party of the political catastrophe that leaves everyone involved with Trump with reputations destroyed and lives in tatters. Wilson unblinkingly dismantles Trump’s deceptions and the illusions to which his supporters cling, shedding light on the guilty parties who empower and enable Trump in Washington and the news media. He calls out the race-war dead-enders who hitched a ride with Trump, the alt-right basement dwellers who worship him, and the social conservatives who looked the other way. 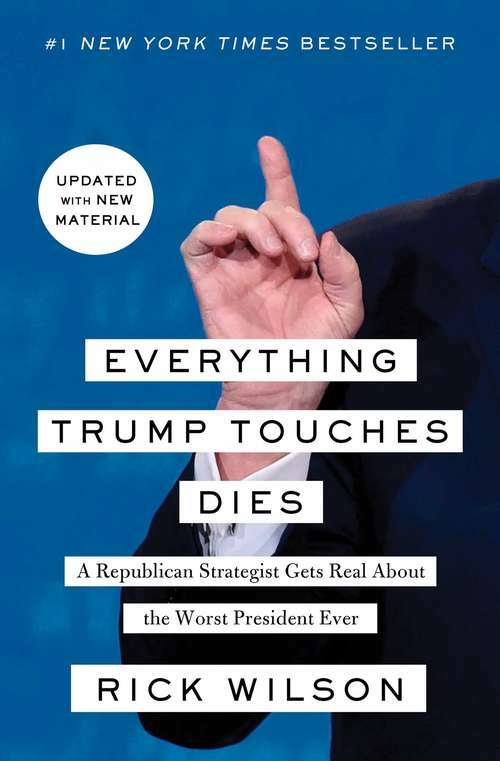 Everything Trump Touches Dies deftly chronicles the tragicomic Trump story from the early campaign days through the shock of election night, to the inconceivable trainwreck of Trump's first year. Rick Wilson provides not only an insightful analysis of the Trump administration, but also an optimistic path forward for the GOP, the conservative movement, and the country. Combining insider political analysis, blunt truths, and black humor, Everything Trump Touches Dies is perfect for those on either side of the aisle who need a dose of unvarnished reality, a good laugh, a strong cocktail, and a return to sanity in American politics.